Available in Alpha Premium range. 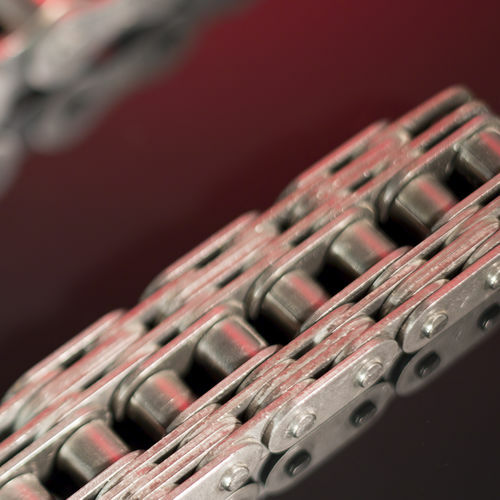 These chains called “belt” chains are always derived from chains with straight side plates. They retain the same characteristics to the nearest lateral dimension. They can be of the lateral type (with plates) with one or two sides. The basis may be a simple, duplex or triplex chain. Their tensile strength does not depend on the number of plates inserted, but on the tensile strength of the basic chain. APPLICATIONS : In light handling, for conveying.loads placed directly on the chain and accumulated. The number of plates limits the contact pressure and hence the marking of parts.